An Exclusive Personalized Shopping Tour with a Top Stylist Designed for Navigating New York’s Most Fashionable District. 8-hour personal luxury styling experience with expert personal shoppers who know what it takes to make you look and feel your best. 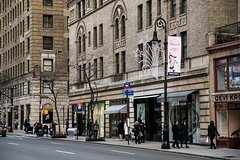 • The Madison Avenue Business Improvement District, the official business association of this world famous shopping area, is offering a full-day (eight hour) personal luxury styling experience with expert personal shoppers who know what it takes to make you look and feel your best.